Army Intel head appears before Foreign Affairs and Defense committee; MK Dichter calls not to attack IDF officers on background of report. Head of Army Intelligence Major General Hertzi Levi appeared this morning (Wednesday) before the Knesset Foreign Affairs and Defense Committee, in light of the Comptroller's report on Operation Protective Edge released yesterday afternoon. Committee Chairman Avi Dichter (Likud) said that "we have all seen in the last few days the artillery barrage directed on Israeli targets before the report's publication and after the report's publication. I would like to say a few words about the shells that have landed on IDF ground. Unlike us politicians who have an Iron Dome and can defend ourselves and fire back in response and sometimes at each other, the military commanders do not have this privilege unless given permission. "We in the committee know very well what was done for two-and-a-half years on the subject of learning Protective Edge's lessons. We will inspect and examine and check how the military and political security systems are prepared for the coming threats. The defense and military echelons are the ones who will have to respond, and so I certainly urge all of us to be a little more circumspect in our statements, as we are discussing commanders." 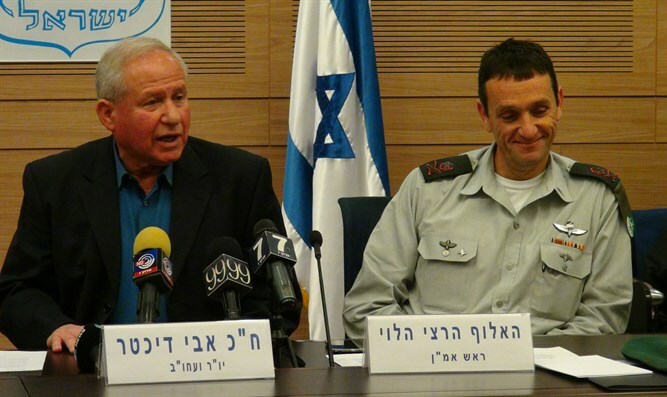 MK Dichter stressed: "I do not know of any statement or sanction contained in the report against individuals personally, and I suggest that we be careful because in the end it's the best of our commanders for whom we have only respect."